Go to the news section of Krakow Info to see the current stories from the city. Standard and Poor’s has sustained its’ current BBB+ rating of Krakow’s municipality debt for 2006. In their assessment the S&P have stressed the city hall managed to stabilize its finances. They think the cons are limited budget flexibility and restricted ability to borrow more. 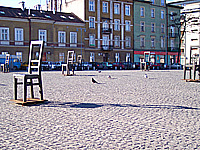 After the 2005 overhaul Krakow’s Plac Bohaterow Getta square on the Wisla right bank has been turned into a monument to the holocaust victims. 70 bronze chairs, 33 oversized and 37 sitable, commemorate some 15,000 Krakow Jews who perished during the German occupation. Between March 3, 1941 and March 13, 1943 the square was part of the Nazi-created Jewish ghetto and place where its inhabitants were being gathered for transports to death camps. Stanislaw Lem, Krakow’s science-fiction writer of a worldwide renown, died on March 27. At 84, he succumbed to heart disease after having been hospitalized with circulatory problems for several weeks. His best-known work is probably ‘Solaris’, a novel published in 1961, that has been made into films twice–first by Russia’s eminent auteur Andrei Tarkovsky in 1971 and recently in 2002 by Hollywood’s famed Steven Sodebergh with starring George Clooney. Mr. Lem’s rich and diverse output has been published in more than forty different languages to date. Krakow’s courts of law completed 565,148 judicial proceedings in 2005. Thus, on average, each of their 465 judges and assistant judges wrapped up four cases per working day. Median duration of a lawsuit in Krakow has been roughly three months for mercantile litigation and even less before the district criminal court. Krakow’s ice hockey team, Cracovia, has won Poland’s championship for 2006. Previously the club held the title in 1949. This year Cracovia celebrates its centenary as the club’s football team played its first match in 1906. Special train service has linked the most popular places of pilgrimage in the Krakow region, all of them particularly related to John Paul II. The purpose-built, state-of-the-art train shuttles three times a day between Krakow and Wadowice, the late Pope’s birthplace, via Krakow’s Lagiewniki district and the town of Kalwaria Zebrzydowska, famous for the Sanctuary of Divine Mercy and for Europe’s largest Calvary sanctuary respectively. Air-conditioned cars with facilities for the disabled take 160 passengers who may enjoy multimedia presentations in Polish, English, and German about John Paul II and their travel destinations. Tickets cost an equivalent of about 3 euro one way and roughly 4.5 euro return, and they stay valid throughout the day so a single ticket suffice for a day-trip to all of the above-mentioned sites. The so-called ‘Papal Train’ (Paciag Papieski) leaves from Krakow’s central station at 8:55 a.m., 12:55, and 16:55, arrives to Wadowice at 10:08 a.m., 14:08, and 18:08, and it’s back to Krakow Glowny main station at 11:43 a.m., 15:43, and 19:43. Krakow’s current eighteen administrative districts, dzielnica, have been given names in addition to the Roman numbers that previously served as their denotations. The city council toiled for a year over its resolution that tries to adjust historical designations to fairly new entities that rarely match borders of traditional neighborhoods. Anyway, Krakow officially divides now into the following boroughs: Dzielnica I Stare Miasto (i.e. the Old Town), Dzielnica II Grzegorzki, Dzielnica III Pradnik Czerwony, Dzielnica IV Pradnik Bialy, Dzielnica V Krowodrza, Dzielnica VI Bronowice, Dzielnica VII Zwierzyniec, Dzielnica VIII Debniki, Dzielnica IX Lagiewniki-Borek Falecki, Dzielnica X Swoszowice, Dzielnica XI Podgorze Duchackie, Dzielnica XII Biezanow-Prokocim, Dzielnica XIII Podgorze, Dzielnica XIV Czyzyny, Dzielnica XV Mistrzejowice, Dzielnica XVI Bienczyce, Dzielnica XVII Wzgorza Krzeslawickie, Dzielnica XVIII Nowa Huta. Pope Benedict XVI is going to spend the second half of his four-day pilgrimage to Poland, May 25-28, in Krakow and its vicinity. The highlights of his Krakow itinerary include a huge open-air High Mass at the Blonia common, an elite one in the Wawel Cathedral, and meeting the young in the Lagiewniki Sanctuary of Divine Mercy. The Holy Father will also see three sites in the Krakow region, i.e. the former Auschwitz death camp in Oswiecim, John Paul II’s birthplace in Wadowice, and the Calvary sanctuary in Kalwaria Zebrzydowska. As regards the first half of his Poland’s pilgrimage, Benedict XVI plans to spend May 25 and May 26 in Warsaw and in the Jasna Gora sanctuary in Czestochowa. Polish government banned selling any alcohol anywhere in Krakow during Pope Benedict XVI’s visit to the city on May 27 and May 28. The temporary prohibition was extended also to some other powiats (counties) in the Krakow region on the Holy Father’s itinerary: chrzanowski, krakowski, myslenicki, oswiecimski where the Auschwitz site is situated, and wadowicki with Wadowice and nearby Kalwaria Zebrzydowska. Concurrently a two-day ban on selling any beverages with alcohol content above 4.5 percent was announced for the entire Malopolska province whose capital city is Krakow. Krakow’s archbishop Stanislaw Dziwisz, 67, has been appointed a cardinal. Before having taken over the Krakow archdiocese last August, he had been John Paul II’s private secretary for 27 years. As the late Pontiff’s closes associate for over a quarter of century, don Stanislao, as the prelate is widely known in Vatican, became the Holy Sees’ eminence grise. Then Krakow’s archbishop Karol Wojtyla, future pope John Paul II, made 27-year-old Father Dziwisz his chaplain in 1966 and would take him to Vatican in 1978 as his most trusted aide till death last April. In 2006 public funds to the tune of 10 million euro, nearly two million more than the previous year, have been earmarked for renovation of Krakow’s historical buildings. Largest grants, roughly 790,000 euro each, were allotted for the refurbishment of the 16th-century Cloth Hall and the Wawel Hill’s improvements, namely fortifications repairs and the restoration of one of the cathedral’s chapels. The rest of this year’s renovation donations are disbursed among 101 other landmarks in need of renewal. Police data for the Malopolska Province – population 3.3 million of which some 800,000 living in Krakow proper – shows criminality on decrease in the first half of 2006. The total of 43,182 instances of lawbreaking, mostly petty crimes such as minor burglaries or wallet-pinching, have been reported over the six months till June 30 against 46,349 offenses in the corresponding period of 2005 and 52,943 in the first half of 2004. Most noticeable are the 50-percent decline in robberies and the 25-percent one in car theft. The sharpest fall in the number of reported transgressions, misdemeanors and felonies occurred in Krakow itself. The police connect the ebbing crime with the emigration of the young unemployed, potential troublemakers in that number, to the Western Europe after Poland joined the European Union in 2004. Recently published stats paint bright picture of Krakow economy in the first half of the year with the year on year productivity growth of 13.1 percent throughout the entire Malopolska province. Sales volume has risen by 11.8 percent in industry and 14.1 percent in construction while retailers have sold 12.3 percent more in money terms and wholesalers have managed to increase their turnover by massive 36.3 percent. Employment is up 1.9 percent and the average monthly pay has risen by almost five percent to 2,539 zlotys but it still slightly lags behind the country’s 2,624 zlotys. Krakow’s municipal transport corporation, MPK, has equipped 17 of its buses with outside cycle racks, secured with safety locks. They run on lines connecting the downtown with parklands west of it as well as those that link the city with some green outer suburbs. The runs are denoted with letter R in the timetables of the following bus lines – 109, 134, 155, 210, 248, 268 (weeklong), 147, 218, 255 (weekdays), and 209, 226, 230, 258 (weekends and holidays). The service is available to bicycle owners solely on the first and last stops as mounting bikes on the racks requires assistance of the driver. The Estonian honorary consulate has opened in Krakow’s central Old Town historic district at 15 Florianska street. It’s Estonia’s third such outpost. Nine other nations have honorary consuls in Krakow in addition to eight regular, fully-fledged consular posts (see the list). Long-awaited shuttle train has linked Krakow’s John Paul II International Airport in Balice with the Krakow Glowny main rail station in the city center. It supplements bus services and taxi cabs as the means of transportation to and from the airport, now busiest than ever. On average, trains run every thirty minutes between 4 a.m. and midnight and the 15-kilometer journey lasts about 15 minutes. A single ticket costs an equivalent of roughly one euro. Tickets are being sold on the train. Krakow’s municipality has inspected the city’s mushrooming hostels, finding – surprise, surprise – no significant faults. A special task force examined the standard of accommodation, condition of bathrooms and other facilities, cleanliness, and whether price lists and other information published online are accurate. Hostels and the like lodgings account for about 11,000 of Krakow’s 26,000+ tourist accommodation options, the rest being mostly hotel rooms. Poland’s police headquarters has launched a summer hotline for foreign tourists. Over a fixed line, one may dial free number 0 800200300 to get safety advice in English or German or Russian. Over a cell phone the same is available at number 608599999 and then the connection costs whatever your telecom charge for a normal call. The service is available through September 30 from 10 a.m. to 10 p.m. This October the record number of almost 35,000 new students are to begin their studies in Krakow universities and the city’s other institutions of higher education, while some 45,000 other applicants have been rejected. Curriculums most popular with the freshmen are law and psychology at the Jagiellonian University, sociology and computer science at the AGH University of Science and Technology, and finances with banking at the Academy of Economics. Krakow’s City Council has created the 1,107-hectare Zwierzyniec Culture Park (Zwierzyniecki Park Kulturowy) just west of the downtown, a mile or so from the central Old Town historical district. It comprises parklands, notably the Las Wolski forest, as well as a good deal of Wola Justowska inner suburb, the city’s most prized residential area. And it boasts such landmarks as the 17th-century Bielany monastery, the Kosciszko Mound and the Pilsudski Mound. The new entity is meant to protect the bucolic area from excessive development. The Readers of the ‘Travel+Leisure’ magazine, a US monthly with ties to the American Express company and the estimated readership of 4.5 million, have voted Krakow the world’s fifth most attractive city this year. Florence, Rome, Venice, and Istanbul rank higher than Krakow on the list of ‘The World’s Best Cities’, while Paris, Prague, Siena, Seville, and Barcelona occupy slots 5-10 respectively. Last year Krakow was placed tenth on the same list. Giant new shopping mall has opened next to Krakow’s central Old Town historic district. The strategically situated 123,000-sq-meter Galeria Krakowska adjoins the city’s Krakow Glowny principal rail station that itself abuts the main bus depot. The immense shopping center boasts 270 shops and department stores, 14 eateries, and 9 coffeehouses. It forms the first part of the New City (Nowe Miasto) project to be supplemented with hotels, office buildings, and blocks of flats in three to four years. Krakow’s 18th International Triennial of Graphic Arts consists of 30-plus exhibitions in the city’s various galleries and museums. The flagship show in the Bunkier Sztuki gallery, 3a Plac Szczepanski square at the Planty gardens, features 300 best works of the total of 4,500 entries for this year’s competition sent by nearly 2,000 artists from all continents save the Antarctic. The Grand Prix award has been bestowed on Belgium’s Ingrid Ledent. The triennial lasts through mid-October. Over 20,000 visitors bought tickets for an equivalent of 1.8 euro each to see the 10th Krakow Book Fair, October 19-22. At the same time 412 publishers and other exhibitors tried to woo them to their stands and a couple of hundred authors turned up to sign their books. The bestseller was this year’s Nobel Prize Winner Orhan Pamuk’s ‘The Snow’, published in Polish by Krakow’s Wydawnictwo Literackie publishing house, that sold 450 copies or so. Also, nearly 500 fringe events, such as readings, took place all over the city. Krakow’s incumbent mayor Jacek Majchrowski, a university professor by profession, has won his second four-year term in the office in this year’s local elections. In the runoff on November 26 Mr. Majchrowski, a leftist running on an independent ticket, has got 60 percent of the vote against an opponent from Poland’s ruling right-wing PiS party, Ryszard Terlecki, also a university professor. Two weeks earlier in the local elections centrist PO party has won a slim majority of 22 seats in the 43-member city council, trailed by PiS with 19 seats. The local elections on November 12 has produced new government of the Malopolska Province (Wojwodztwo Malopolskie) whose metropolis and capital city is Krakow. In its aftermath the right-wing PiS party has dropped its erstwhile coalition partners of the centrist PO party and teamed up with smaller factions, the far-right LPR and the PSL peasant party. In the 39-member provincial parliament (sejmik) PiS enjoys plurality of 16 seats against 13 in the hands of PO, while LPR and PSL have 4 each, with the remaining two seats taken by leftists. Krakow rejoices at the arrival of two Asian cow elephants to the city zoo. 40-year-old Baby and her friend Citta, 30, have been purchased from Spain’s Terra Natura Park in Valencia for euro 30,000 plus euro 17,000 transport costs. Krakow zoo’s previous single elephant died last July and ever since various local politicos have vied to find the replacement. 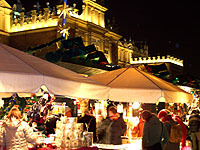 Krakow’s Christmas market takes place on the Old Town’s Rynek Glowny central square till December 26. From 8 a.m. till 8 p.m. wooden stands sell an assortment of the season’s decorations and sweets as well as other wares, from jewelry to ceramics. Special attractions include folk dances, concerts of carols, various shows, etc. And outdoor food joints offer hearty meals and mulled wine. 52-foot-tall Christmas tree has shot up on Krakow’s central Rynek Glowny square overnight, a sure sign that the festive season engulfs in the city. Over 400 decorations bedeck the grand spruce, illuminated by 8,000 lights. At the same time it looks like more streets than ever, including almost all in the Old Town historic district, have got Yuletide finery this year. The festive glitter will last in Krakow till early February, courtesy of Poland’s long Christmas season. 100,000 dumplings, six tons of sauerkraut with mushrooms, and 6,000 helpings of wild-mushroom soup–traditional Polish dishes for Chrismas Eve’s wigilia dinner–featured in the free meal for the poor on Krakow’s central Rynek Glowny square on December 17, the last Sunday before Christmas. The well-publicized yearly open-air feast, courtesy of two local food companies, has gathered thousands of the city’s needy residents as well as the homeless from other parts of Poland for the last nine years. Hardly a month passes in Krakow without some time-honored occasion for common festivities or colorful ceremony. There are over fifty culture festivals in Krakow every single year. Copyright © 2006, 2015 by MAREK STRZALA. All rights reserved.